On November 15, 2015 in Denver, Colorado the Denver Broncos Quarterback Peyton Manning made NFL history yet again. 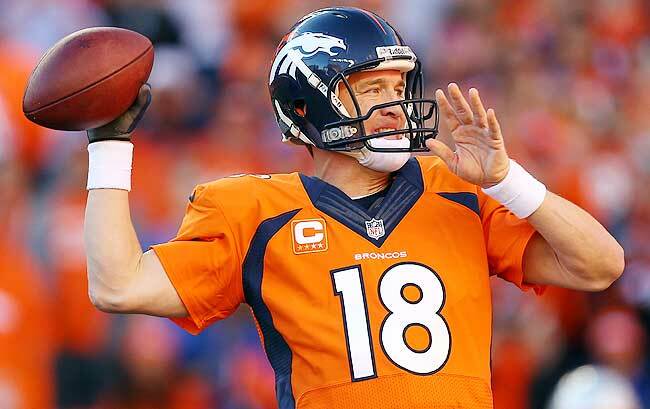 During the Kansas City Chiefs VS Denver Broncos game Manning completed a 4-yard pass early in the first quarter. This 4-yard pass put Manning at 71,838 yards passing for his career and set the new record for that category. Peyton Manning passed the previous record holder Brett Favre. Manning also has an opportunity to pass Favre in another category as well, all-time regular-season wins at 186. Manning will have 187 regular season wins with his next victory. Nothing is more exciting in any professional sport than a playoff game. American’s have enjoyed the NFL playoffs for eight decades. Since the NFL’s inception there have been over 500 playoff games. That tradition did not start in 1920 with the league’s inception. From 1920-1923 the NFL Champion was voted by the team owners. During the 1924-1932 seasons the Championship was won by the team with the best record (win percentage) at the end of the season. The 1932 season was the final season before a Championship Game was instituted. The final game of the ’32 season was technically a “playoff” game. The Chicago Bears (6-1-6) and the Portsmouth Spartans (6-1-4) shared the league’s best win percentage of .857. To settle the tie an addition game was played between the two teams. The Bears were victorious in that final contest by a score of 9-0 over the Spartans. 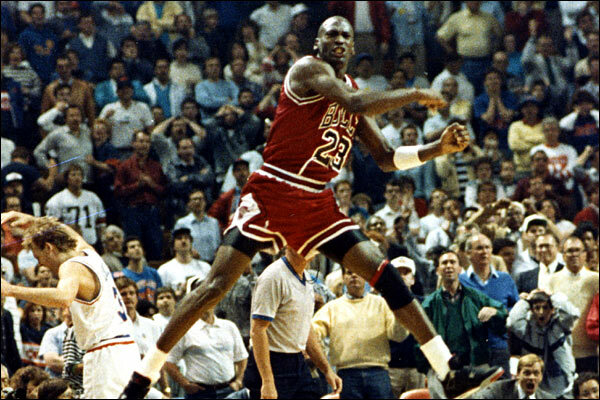 This game was recorded as a regular season game in the record books for both teams. At the conclusion of the the 1932 season the NFL decided that a Championship game would take place at the end of every season. The two teams holding the best record in their division (Eastern and Western) would face each other to determine a champion. Thus began what we now know as the NFL Playoffs. 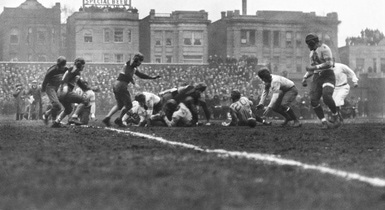 On December 17,1933 at Wrigley Field in Chicago, IL the first NFL Championship Game took place. The Western Division’s Chicago Bears (10-2-1) went to battle with the Eastern Division’s New York Giants (11-3). This game featured two of the NFL’s all-time greats, Red Grange and Bronco Nagurski both playing for the Bears. The Bears drew first blood with a Jack Manders 16-yard field goal in the 1st quarter. In the 2nd quarter the Bears would receive another field goal from Manders, while the Giants QB Harry Newman threw a 29-yard touchdown pass to Red Badgro. The Giants led 7-6 going into halftime. When the second half began the Bears would retake the lead with another Manders field goal. The Giants quickly responded with a 1-yard touchdown run by Max Krause, the Giants now held the lead by a score of 14-09. The Bears scored their first touchdown of the game Bronco Nagurski touchdown pass to Bill Karr before the 3rd quarter concluded. The 4th and final quarter began with the Bears holding a 16-14 lead over the Giants. The lead would change early in the final quarter when the Giants QB Harry Newman completed his second touchdown pass for the day to Ken Strong to take a 21-16 lead. The Bears came through in the final two minutes to take the lead and the win with a Bill Karr 19-yard touchdown reception. The Bears defeated the Giants 23-21 on that day. The Bears became the first NFL team to capture a championship via a “playoff” game. Many people debated whether the first NFL game was in 1932, 1933 of 1967. The 1932 game was not officially scored as a “playoff” game while the 1933 game was. The semifinal playoff games did not begin until the 1967 season so some consider it to be the first season with a playoff. I feel that the 1933 game was a playoff game and has even officially been regarded as that by the NFL. With that being said, the first ever NFL Championship game was the first playoff game ever. On August 11, 1994 the final game of the 1994 MLB Season was played between the Montreal Expos and the Pittsburgh Pirates. The Pirates were victorious on that day winning by a score of 4-0. Twenty years ago today the history of baseball changed forever. There have been strikes in the game of baseball before but none of them were as damaging to the game as this one. Here is the short story of what transpired prior to August 11, 1994. The MLB Players Association had been going back and forth with the MLB Oweners for almost one year over a proposed salary cap. The Owners claimed it was necessary to have a salary cap in place for small market teams to survive the current state of MLB. The salary cap combined with local television revenues would sustain the smaller market teams and thus benefit all of MLB. The players were not willing to agree to the terms the owners had set and after numerous negotiations decided as a group to sit out the rest of the season. On top of all of the problems between the two sides there had not been an official commissioner presiding over baseball since 1992. Baseball needed a commissioner that could moderate between the two sides. On August 12, 1994 The strike officially began and America would not see Major League Baseball action until the strike ended on April 2, 1995. Judge Sonia Sotomayor of the United States District Court for the Southern District, New York, issued an injunction that ended the strike. Judge Sotomayor ruled that the players and owners were bound by the expired collective bargaining agreement until a new deal could be reached. 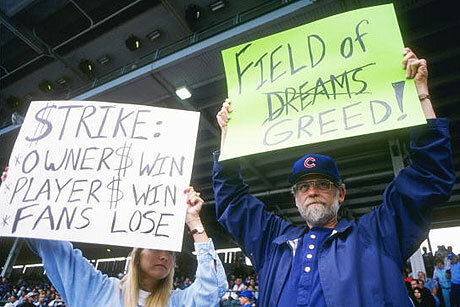 The strike lasted a total of 232 days and reduced the 1995 season to 144 games from the traditional 162 games. Throughout the 1995 MLB Season the fans showed their displeasure with the strike that had tainted the game that they love. Many fans saw it as two greedy side fighting for more money. Fans all over the country showed their disdain for the players in their own ways. Many fans decided not to go to games or buy any MLB merchandise, while other fans decided to show up and let the players know how they felt by throwing objects at them and taunting them. Baseball did not see much gain in popularity until the steroid driven home run fest of the late 1990’s. The “Steroid Era” further damaged the game of baseball when it was made public in the mid 2000’s. Because of the 1994 MLB Players Strike there was no World Series played that year, it was the first season without a World Series since 1904. There were many casualties of the strike of the 1994 Strike. The most notable were the Montreal Expos who were having their best season in team history and lead baseball with a 74-70 record when the strike ended. The Expos would have likely reached the MLB Playoffs and possibly even the World Series but instead faded into obscurity. The franchise would not reach the post season until the team became the Washington Nationals more than a decade later. There are many lessons that have been learned from the 1994 Players Strike. The most important of those lessons is that no League can disregard the fans and still profit greatly from them. Many felt the financial impact that the strike had on the game due to raising the fans ire. Baseball was considered America’s most popular sport prior to the strike. It fell behind the NFL in popularity a few years after the strike and has never grabbed its old position back from football since. The game of baseball is a beautiful game but in 1994 it was tainted by greed and the fans were the biggest victims of the dispute between the owners and the players. On this day 104 years ago one of the greatest pitchers of all time won his 500th career game. Cy Young was in the twilight of his career and playing for Cleveland Indians. The Indians were in Washington to play the Senators at American League Park II. The Indians won the game by a score of 5-4 thus giving Young this milestone victory. Young would retire after the 1911 season with a career record of 511-316. Young’s 511 career wins remains the all time record for wins by a pitcher. In 1956 a year after his death, the Cy Young Award was created. The Award is given to the best pitcher in the National and American leagues at the end of every season.